In this lesson, you are going to learn using te-form (て-form) of Verbs or Adjectives as the cause or reason that produces a consequence. This is similar to the previous lesson, where Noun with the particle de (で) is used as the cause or reason. In each sentence pattern, Sentence 1 presents a cause (or reason) and Sentence 2 presents the consequence produced by the cause. Meaning: Mount Fuji cannot be seen because the weather is bad. Meaning: I cannot buy because I don't have money. The two examples above are grammatically correct. However, native Japanese don't speak in this way. If the Result or Sentence 2 is a verb or an adjective that expresses feeling, or if it's a potential verb or a verb to express a state, then the cause or reason sentence will have to change to te-form (て-form). Note that the verbs that express different states are verbs like ある (aru), いる (iru), なる (naru), etc. Similar to the particle de (で) in the last lesson, this sentence pattern has many constraints or regulations over its usage. As the cause or reason has to be changed to te-form (て-form), it leads to the first constraint for using this sentence pattern. 1. The words which come in the Result or Sentence 2 are limited to those words which do not contain volition or intention. The below three examples are not Verbs nor Adjectives but they are also used to express emotional feeling. Meaning: I was surprised to hear the news. Meaning: I feel lonely as I can't meet my lover. Meaning: I am very glad to receive the present. 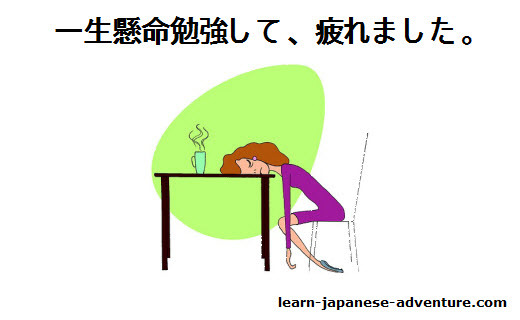 Meaning: I was tired because I studied very hard. Meaning: I was relieved as my friend recovered from his injury. Meaning: I am sorry for being late. Meaning: I was embarrassed because I couldn't answer the question. Meaning: I am not able to attend the meeting because I am not free on Monday. Meaning: I could not understand the story well because it was complicated. Meaning: I can't read the small words because I don't have my glasses. Meaning: I can't sleep because I am worried about tomorrow's test. Meaning: I don't have time to study because I am busy every day. Meaning: The train was delayed due to the accident. Meaning: I was scolded by my boss for being late for work. 2. Expressions containing volition/intention (will, order, invitation, request, permission, prohibition, etc) are not used in Sentence 2. When it contains volition/intention, the phrase with te-form (て-form) cannot be used and instead the phrase with から (kara) is used. Meaning: It's dangerous, so please don't touch the machine. te-form kudasai (て-form ください) is a request which contains intention and thus you cannot use this sentence pattern here. Therefore, example 1 above is incorrect. 3. In this sentence pattern, Sentence 1 and Sentence 2 are sequential events. In other words, Sentence 1 takes place first and Sentence 2 takes place after that. Meaning: There is a test tomorrow, so I have to prepare for it today. Since preparing for test happens before the actual test tomorrow, they are not sequential events. Therefore, you cannot use te-form (て-form) but have to use から (kara) here instead. Lesson 34: Japanese particle de for Cause or Reason.